Democrats sparred this past weekend at San Jose McEnery Convention Center, host of this year’s state party convention. The three-day event—basically Comic-Con for political nerds—branded the GOP broken in the lead up to Donald Trump’s likely nomination, but it appears Dems are also going through a bit of an identity crisis, as factions split over Bernie Sanders and Hillary Clinton. In the lead up to the keynote speech by Vice President Joe Biden, contenders for the U.S. Senate seat being vacated by Barbara Boxer—Rep. Loretta Sanchez and CA Attorney General Kamala Harris—delivered back-to-back pitches to delegates. Sanchez rambled along with hand gestures and expressions similar to right-wingin’, gun-slingin’ Sarah Palin, and even had a bizarre “9/11 was bad” moment. Harris ended her speech to a standing ovation and won the party's endorsement in a landslide. The main event did not go without controversy. As Biden spoke passionately about the passing of his late son, Beau, a heckler interrupted the veep claiming that a cell phone caused the tumor that killed Biden’s son. The audience booed but Biden gracefully told the room: “Thank you, but that’s alright. It’s okay...my son Beau would have loved that part...Let’s not act like Republicans.” Rep. Mike Honda’s supporters also created tension by passing out anti-Ro Khanna literature portraying him as a puppet of corporate interests. Honda’s people claimed to have no role in the distribution, but the irony wasn’t lost on delegates aware of Honda’s ongoing pay-to-play ethics probe. Ultimately, Honda bested Khanna to receive the party endorsement. 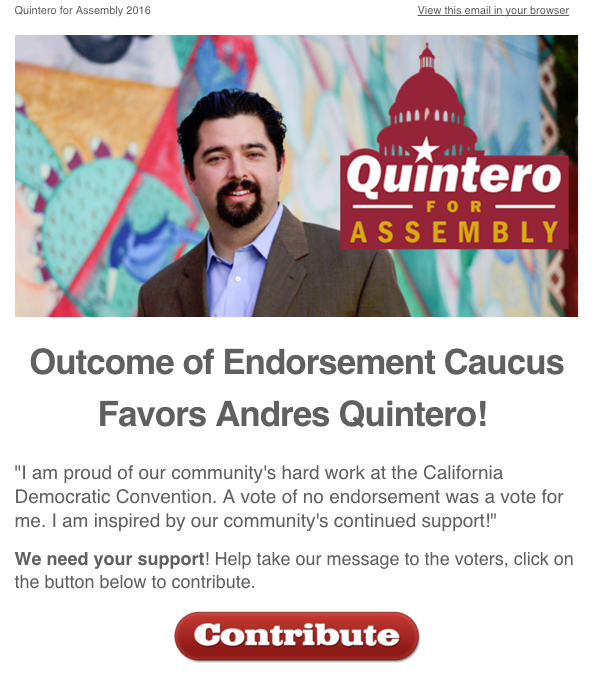 The battle for party backing in the 27th Assembly District race was contested by Andres Quintero, who challenged a pre-endorsement for Ash Kalra. Quintero oddly claimed victory after no one got the nod. Assm. Nora Campos provided the biggest shocker, telling people she will challenge Sen. Jim Beall for his seat this year, rather than wait until 2020. It should be hilarious and terrifying all at once. I’m mad at myself for missing this opportunity. I could have raised money and donated a carload of custard pies, super soakers, and cheap whiskey. My mission to introduce this Irish word back into the lexicon of SJI vernacular has succeeded! It is a wonderful word, spanning the distance from micro-aggression to felony. Even “South Park” has embraced it. “Mission Accomplished”! Now please leave…. >“Mission Accomplished”! Now please leave…. Every post like your encourages me to stay.. Longer! I think the innuendo embedded in saying “Honda supporters passed out brochures…” and “…the irony wasn’t lost on delegates…” is misleading. A more objective, impartial account would simply note that such brochures were passed out, that their source was not known or disclosed on the brochure, that the identity or political persuasion of the distributors is unknown (a false flag operation is always a possibility), and that the Honda campaign stated (not “claimed”) they had nothing to do with it. Craig, I get that you’re a Honda supporter. But today’s politico article states that the Honda campaign’s printer for its multiple negative hit pieces on Ro last cycle was the SAME one who printed these pieces (do you know how many printers there are!!!). In fact, one of the hit pieces used the same exact language. When asked, the printer did not deny that the Honda campaign was the client (nor, coyly, did they confirm it either). Honda’s doing the same hits he’s always been doing against Khanna, just this one was a bit more over the top. He didn’t want to have his hands on it. Sorry, that’s against the law. I’m a believer that when there’s alot of smoke, there’s always a fire. Given Honda’s numerous ethical lapses these past few years, he’s lost any moral high ground or believability of “trust me, I didn’t do it”. He looked smug on Saturday and not sorry/embarrassed at all that these pieces had been distributed. That is not how an innocent man acts. If he hadn’t done it, he would have been completely shocked and shown his distain for lit like that being passed out in that environment (also a violation). It was more of a “go ahead, catch me if you can” look on his face and in his own words. Nope, he did it. NEWDEM2016 – I agree with you that when “there’s a lot of smoke, there’s always a fire.” So you must be outraged Ro Khanna recruited fake candidates to run in the last election cycle to split his opponent’s votes so that he could advance. Messing with a federal election is corruption to the core, and deprives constituencies of their voice – not to mention is probably illegal. I’m sure this disqualifies Khanna in your eyes for Congress, because it’s much more serious than some flyers. I followed that whole episode pretty closely when it happened. Personally, I don’t count reporting from this pando blogger as credible. I prefer Chron, Merc, SJI, etc. For this story, MercNews’ Richman did thorough reporting. Khanna or his campaign didn’t have anything to do with any of that. Some of his supporters, however, absolutely were a bit too enthusiastic and signed a petition for one of the candidates to be on the ballot. Sorry, CC (or should I say Ron Cohen?) I don’t agree. Only Ron keeps pushing this pando link. Just calling it. Same old politicians running and a political machine that keeps them going. Anyone with a pulse could be more effective than Honda. In 14 years the only bill he authored that has passed was a bill to name a post office after one of his largest campaign donors. Most of Sleepy Mike’s proposed bills never made it out of committee. That’s how “highly” he is regarded by his colleagues. Yet, since he’s a loyal Democratic Party water boy/bag man, he gets the party’s endorsement. What does that say about the credibility of the Democratic Party establishment? We need someone more important than a Go-fer as our representative. Just a little safety tip: look out for flying anvils. Barking Dogs, Only Bark! They have no Bite.JMO! Mike has the heart of a Teacher, and the Spirit of a Warrior. He has stood up, to the rigors of a community, that Flys with the wind of Greed. This is awesome. Keep this going. Honestly this is better than a focus group. > It should be hilarious and terrifying all at once. I can sense the enthusiasm building for the California Dem primary.